Dr De Vries Basson is a Specialist Physician experienced in clinical trials with a special interest is cardiovascular diseases. 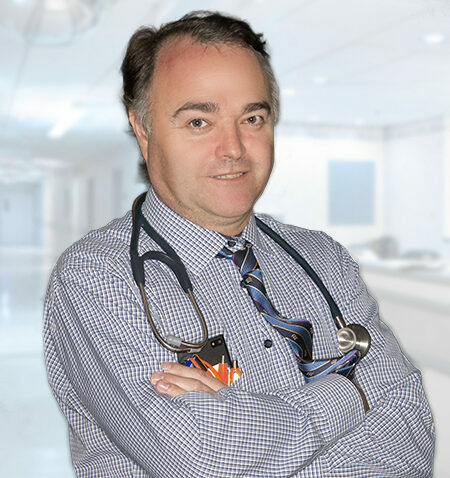 Dr Basson serves as Head of Internal Medicine at Karl Bremer and contract Principal Investigator at TTC. In this role, he oversees the Department of Internal Medicine and also forms a link between the hospital and TTC. He is also very active in the pre- and postgraduate educational programmes of the University of Stellenbosch. Dr Basson provides over 12 years’ of clinical research and 12 years’ as a specialist physician. He has taken part in many studies and he was asked to represent South African Prevail investigators at the International Stroke Congress in San Francisco in 2007 and also attended the International Stroke Congress in Los Angles now in February 2016. Dr Basson completed his undergraduate studies in 1996 and postgraduate training in 2003, both at the University of Stellenbosch. He completed the Hons in BSc (Epidemiology ) at University of Stellenboch in 2010. He has been Head of Internal Medicine at Karl Bremer Hospital since July 2005. He is also actively in WP Cricket as Convenor of Local leagues for the past 10 years. He also serves on the Metropool Pharmaceutical and Therapeutic Committee since 2014. He has also been a promoter of many MMed research projects in Internal medicine at the University of Stellenbosch.